Bernard Braden was a Canadian journalist and broadcaster who, with his wife Barbara Kelly and their three children, was resident in the UK from the late 1940s. Soon after their arrival Braden and Kelly both achieved some career success in BBC radio. In the early 1960s Braden moved to independent television as the host of the consumer and current affairs show On The Braden Beat (ITV, 1962-67). The series offered a mix of serious issues with humour and music. With the ending of that series Braden began to develop a new programme idea, provisionally titled Now and Then. The core idea was that leading public personalities in a number of discrete fields, including politics, business, social affairs, entertainment and sport, would be interviewed about their careers, hopes and aspirations. The interviews would be filmed and then, a couple of years later, the subjects would be revisited to see how things had turned out. Braden financed the complete project himself and the first interviews were recorded in September 1967. Between September 1967 and June 1968 over 330 interviews were filmed, a total of nearly 110 hours of footage. The programme idea was never realised as Braden was given the chance of hosting a new show on BBC television, Braden's Week (1968-72), and the interviews remained in storage, unused for 40 years. In spring 2008, the complete collection of interviews was donated to the BFI . Some of the personalities interviewed included the recently-elected leader of the Liberal Party, Jeremy Thorpe ; Enoch Powell , interviewed just weeks after his infamous 'rivers of blood' speech; Huw Wheldon , the BBC's managing director of television; Robert Maxwell , then a Labour MP and head of Pergamon Press; former Conservative Chancellor of the Exchequer Reginald Maudling ; and a host of showbiz and other personalities, among them Quentin Crisp , Tariq Ali , Dame Sybil Thorndike , Tom Jones , Beatles producer George Martin , and Braden's teenage daughter and actress, Kim. There are also several shorter interviews under the heading BOP (Braden Opinion Poll) in which he canvassed the attitudes of ordinary people to contemporary events. He freely admitted that the BOP participants had not been selected 'scientifically'. 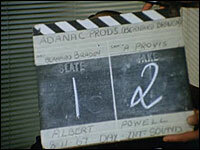 The interviews have been digitised and archived in the exact the form in which they were recorded, so many interviews start with a clapperboard and sound check, and in some instances end rather abruptly. The off-screen interviewer was usually Braden himself, although Barbara Kelly and Derek Hart , a former BBC Tonight journalist, also handled some interviews. During the 40 years between recording and the collection's donation to the BFI National Archive, some of the material has gone missing. In some cases soundtracks have been lost - as in the interview with the controversial black activist Michael X. The completed pilot programme was also lost. However, the collection's owner and Braden's former production associate, Gillian Best , has generously re-created the pilot, with considerable help from BFI National Archive staff and the London-based production facility, Blue . In December 2008 extracts from the Now and Then interviews were screened on British television for the first time in a three-part series shown on Five. The programmes mixed the archive interviews with present-day interviews including their subject's reactions upon seeing and hearing their earlier selves.